The Six Month Smile system is exceptionally effective at straightening your teeth quickly and safely. These discrete braces focus on the ‘social six’ teeth, the front six that feature most prominently in your smile, and will guide them into a better position over as little as 6 months. At your initial consultation we will assess your eligibility for the Six Month Smile system and take photos and x-rays of your teeth so we can realistically estimate your treatment time. This is your chance to find out all about us at Heaton Mersey Orthodontic Centre and ask any questions about your Six Month Smile treatment. If it transpires you are not eligible for this system, then we have other teeth straightening systems that may benefit you. After your eligibility is confirmed, the next step is to fit the braces! These use tooth-coloured wires which are barely noticeable, so your treatment should remain discrete. We tailor this brace system to each individual patient, so you will receive procedural care that is right for you. Check-up appointments may be required just to make certain that you are on track for your results, but you could have straighter teeth within 6 months! Your dentist at Heaton Mersey Orthodontic Centre will also talk with you about a retainer to optimise your results. What are Six Month Smiles braces? Six Month Smiles is one of the most popular fast-acting brace systems currently available. As the name of the system suggests, in some cases it is possible to straighten teeth in as little as six months. How can I have a straighter smile in six months when traditional braces may take up to two years? 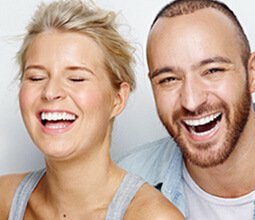 The Six Month Smiles system uses cutting-edge technology and techniques to move your teeth quickly and safely. These braces mainly focus on moving the ‘social six’ teeth, i.e. the six top middle teeth that everyone can see when you smile. Six Month Smiles can be used for other cases, but your treatment may take longer than six months. If you case is more complex, another brace or aligner system may be more suitable for what is considered comprehensive treatment. Will everyone be able to see that I’m wearing braces? Another reason that Six Month Smiles is so popular is that the braces use clear brackets and tooth-coloured wires, which makes them more discreet. Will the treatment hurt more because my teeth are being moved more quickly than with traditional braces? People often assume that Six Month Smiles and other fast-acting brace and aligner systems work by applying greater forces to the teeth to make them move quicker. This isn’t the case. Six Month Smiles still uses gentle forces to move your teeth. The treatment is simply faster because we concentrate on your visible teeth rather than the whole arch. Could fast-acting braces such as Six Month Smiles damage my teeth, roots, or gums? There are no more risks of damage to your teeth, roots, or gums with Six Month Smiles than with traditional orthodontics. In fact, because Six Month Smiles uses light forces and - by concentrating on the teeth that can be seen, we rarely need to carry out extractions. As with all braces and aligners, you will need to wear a retainer after your treatment to keep your teeth in their new, straighter position. We will discuss the option for your retainer – including whether you have a removable or bonded retainer – before you start your treatment and as it progresses. Fill out our form below to book a free brace consultation with our specialist team.